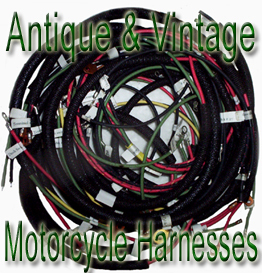 One complete set 1929 & 1930 Dual headlight wiring, correct period cloth covered wiring harness for the models listed D, DL, V, VL .Period color cotton braided wire with shielded cable covering.Each wire on this harness has been labeled for easy installation.Each wire soldiered like originals. This sale is for one 69135-47 Headlamp,Fender,Horn insulator Terminal Kit.Fits: 1945 to 1948 Big Twinsand 1945 to 1947 Servi-cars.Reproduction. Email with any questions.